When the pyramid was almost finished, casing blocks of white limestone were laid on top of the main pyramid blocks. Each casing block was then trimmed so that the outer surface of the pyramid would be smooth and white. The casing blocks from the Great Pyramid were all removed in the 14th and 15th centuries A.D. and used to build the city of Cairo. 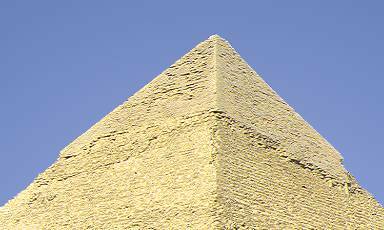 Some casing blocks still remain on the top of the pyramid next to Khufu's (belonging to Khafra).